View of “Liz Deschenes,” 2013. 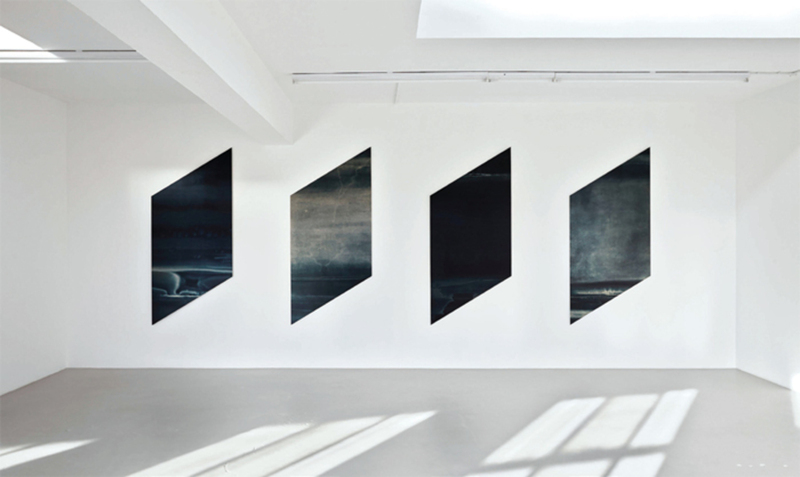 In the first room of American photographer Liz Deschenes’s exhibition “Bracket (London),” a series of deep viridian photograms hung unframed in a neat row: Bracket 1, Bracket 2, Bracket 3, and Bracket 4 (all works 2013). The surfaces of these four large parallelograms, designed to reflect the light and shadows cast by the gallery’s skylights and windows, changed according to the fluctuations of the natural daylight that streamed in. The gallery’s second room contained two more photograms, silver-toned and tarnished-looking, which offered a stark contrast to the iridescence of the previous space. One, Bracket 6, was hinged at right angles to the wall, as though a blank window or door, while the second, Bracket 7, was curled to create a concave mirror nestled inside a smaller open box frame.